Digital Marketing (Online Marketing, Internet Marketing) has been an ever-growing advanced marketing in the modern world. It has a well-developed structure highly required by the business to succeed and flourish exponentially. It has dominated the traditional marketing platform due to its effective technology features. 30 hours of Online Live Instructor-led Classes. Weekend class:10 sessions of 3 hours each and Weekday classes. Live project based on any of the selected use cases, involving Big Data Analytics. You get lifetime access to the LMS, Class recordings and presentations can be viewed online from the LMS. Towards the end of the course, you will be working on a project. Big Data and Hadoop Expert based on the project. About Advanced Digital Marketing Training? What are the objectives of our Advanced Digital Marketing Online Course? The Advance Digital Marketing Training will teach you WordPress, Search Engine Optimization (SEO), Social Media Marketing (SMM), Social Media Optimization (SMO), Google Ad words, Google Analytics, Online Reputation Marketing (ORM), Email Marketing, Affiliate Marketing, Google Adsense, etc. Digital BigClasses is providing Online Training with free E-Books, Course Materials, and Workshops. Our Digital Marketing Course curriculum has been professionally designed by highly experienced experts. Our trainers will teach you every subject in details with current marketing trends. The training will develop student’s skills in Digital Marketing and its techniques. It will make them confident to be an excellent Digital Marketing Specialist. The Advanced Digital Marketing Online Training will be taught only in 100 hours, respectively. What are the skills that you will be learning with our Advanced Digital Marketing Training? This course will help you understand various concepts of Digital Marketing such as SEO (Search Engine Optimization), SMM (Social Media Marketing), PPC (Pay Per Click), CPC (Cost per Click), CTR (Cost Through Rate), CTA (Call to Action), Web Analytics, Content Marketing, etc. You learn how to utilize different tools of Digital Marketing such as Google Analytics, Google AdWords, Facebook Advertisements, YouTube Advertisements, SEO Checker, and much more. You will be able to use the above tools for your projects and assignment while learning this course. It will make a positive impact during your interview. You will be able to convey the right message to the right people. Who should go for this Advanced Digital Marketing Training Course? This course can be taken by anyone who wants to familiarize themselves with the Digital Marketing. The following are the people who can study this course. Marketing Professionals can enhance their career by learning Digital Marketing. It can help them with their career and make a better decision on their marketing platform. Any graduates can learn this modern marketing technique. It can help them enter an ever-growing field extremely demanded in the modern era of digital technology. CEO professionals can learn Digital Marketing too. They can be confident in making decisions and contributing to the marketing strategy, thus making them more professional. Business Owners are highly welcomed to learn this course. They can apply this marketing methodology to increase their brand awareness, increase their revenue, and much more. IT Professionals have a big deal of benefit in learning this course. 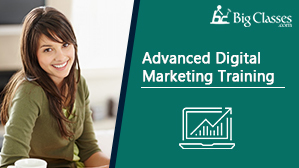 How will Advanced Digital Marketing Training help your career? Online Marketing is the next big career opportunity in the world. It has helped millions of companies increasing their brand awareness and thus transforming their business into a profitable platform. Companies can now target their customers efficiently, increasing their website visitors, advertising to the right customer, and more. Let’s see why one should go for Digital Marketing as their career. According to a source, total internet users in Singapore will increase to 4.93 million SGD in 2022. According to a source, total smartphone users in Singapore will increase to 4.82 million SGD in 2022. Countries paying high to their Digital Marketers are Australia, Netherlands, USA, Canada, UK, Singapore, Spain and more. Companies adopting Digital Marketing increased their profits by 26%. Singapore Companies hiring Digital Marketers are Singapore Airlines, Scoot, Grab, Zendesk, Purple Click Media and many more. What are the pre-requisites for Digital BigClasses’s Advanced Digital Marketing Training Course? There are no particular pre-requisites for learning this course. You only need to know how to use the system and the internet. You should also understand the methods to the search engines. Well, an excellent language skill is an added advantage. Digital BigClasses will provide a certificate to the students who successfully completed their Digital Marketing training. The certification will be provided within one week of the training completion. If a class or classes are missed, you will be provided with recorded videos, that will cover the topic taught in the misses class. The Advance Digital Marketing Training is being provided by Mr. Suresh with 9 years of experience in the Digital Marketing field. The curriculum prepared is up to date, and is constantly revised with the industry standards year over year. The online training will teach you the important concepts and subjects of Digital Marketing based on real-time case studies. Projects and assignment will be given for in-depth understanding of a subject. Course materials and E-Books will be provided and is accessible for 365 days only. Workshops will be conducted for quick learning for Entrepreneurs, Business Men/Women, and Company Employees. The group containing 3 and more members, will have 20% discount for each member. It was a great experience. Suresh Sir covered all the aspects of marketing in an excellent manner. It was easy to learn and implement. This course has many aspects in the digital marketing field, it gave me a lot of insights. I was very happy and it was interesting for me to learn Digital Marketing. I have learnt Digital Marketing, and I have prepared many live projects that helped me get confidence in the PPC and SEO. I have successfully understood the way keywords are used, and how they are analyzed. My training was great, and I am now working as an intern in one of the top companies in Banglore. I have learned in this course and I am very satisfied by the trainer’s way of teaching. He taught all the subjects in detail and didn’t miss nay part. He gave live examples, and also, gave us many assignments, that helped us understand the core of digital marketing. The Digital Marketing online training taught by Digital BigClasses was the right course for me. It was relevant, fresh, and timely. I have learned Digital Marketing in depth. I have learned every corner of it, and I must say, I am very confident now!